Lowdown: A boy and his horse separate and reunite at both ends of World War 1. What can I say about Steven Spielberg? The guy directed some of my favorite films, the stuff I grew up on (see Indiana Jones and the Temple of Doom). Lately, though, the guy's been producing duds (see Indiana Jones and the Kingdom of the Crystal Skull). So which way is it with Spielberg? My theory is that the older and more mature I get, the less appealing I find Spielberg's stuff to be. War Horse, it seems, was made for the sole purpose of confirming this theory of mine. The story takes place around both ends of World War 1. We start off with a hard working farmer's family from Devon, the Narracotts. The father falls in love, if you can say that, with a young horse and buys him at an auction by offering much more than he can afford. Especially given this particular specimen is more of a racing than a working horse. The son doesn't give up on the horse and together they plow the toughest fields at the toughest conditions before an entire bewildered village and the eyes of the skeptic land owner (who doesn't seem alike the classy material of Downton Abbey's nobility). Classic Spielberg stuff. Then the war erupts, and the father that finally comes to his financial senses sells the horse to an army officer heading for France. That army officer perishes with most of his company at his very first cavalry charge - as one should have expected when charging machine guns. The horse survives, though, and moves into German hands. Thus starts a long tale of ownership changes between German, French and English sides. 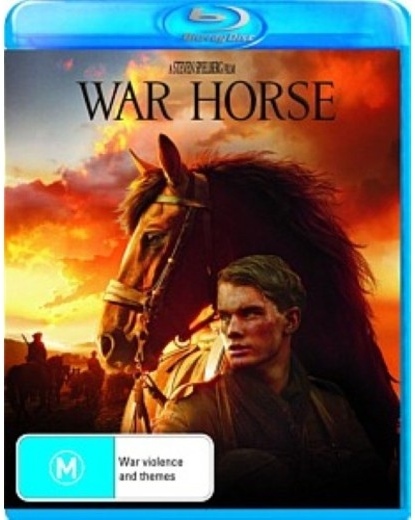 War tragedies strike on all sides, and eventually the question turns into whether the horse and the boy (now enlisted to the British army) will reunite. As I have already hinted, this tale is full of saccharine and improbabilities. War Horse is also full of familiar actor faces; apparently, actors line up to Spielberg's call. What War Horse lacks, however, is any sort of spirit: things are predictable and super corny. So much so that I think I have managed to narrow down my quarrel with Spielberg to this: Spielberg is a director who wishes to assume total control of his spectators' feelings; there is no room left for thinking on the spectator's side. That explains his films' heavy reliance soundtracks, for a start; it also explains why I used to like him more as a kid than I do now. Quarrel identified, I moved on to thinking why War Horse. As in, what does Spielberg seek to find in this over simplistic story of a complicated time in human history? My theory is based around Spielberg's need to say something about key junction points in the field of humanity. He said things about slavery, he said things about World War 2, he even put us inside gas chambers; World War 1 was a gap in his repertoire that needed addressing. This is not necessarily a bad thing, and Spielberg's portrayal of the war is probably one of the better ones ever seen as far as accuracy is concerned. But again, the whole thing feels so artificially manipulative. Say, for example, the scene where our horse brings a temporary ceasefire ala Joyeux Noel (which, may I remind you, was not only there first but is actually based on true events). Best scene: The second auction for the hero horse, at the end of the film, provides touching closure to our story. If, that is, it wasn't so predictably cheesy. Overall: Sadly, War Horse is way too sticky with sweetness and manipulation for its own good. 2 out of 5 stars.